Where: Bryn Mawr College. More details. As groups of students work at the board, the instructors listen in on groups of students working at tables. Financial Aid: With the generous support of the AMS Epsilon Fund and individual donors, we are able to award financial aid for MathILy 2019. All financial aid is based entirely on need, and yes, the entire fee may be waived for an admitted applicant with significant need. In the past we have been able to meet the demonstrated financial need of almost all admitted students, and we expect this will be the case again in 2019. Priority is given to U.S. students over international students, and we do not currently award financial aid to interplanetary or interstellar students. In addition, Mu Alpha Theta has grants for students who have been members for at least a semester. Past MathILy students have benefitted from this excellent program! Number of students: approximately 45, this year. Yes, we existed in several previous summers. More details. Academic details: Class meets for about 7 hours per day, in two shifts (morning and evening), 6 days per week. Each class has a Lead Instructor who is a mathematician with a Ph.D. and one or two Apprentice Instructors who are graduate or undergraduate mathematics students. 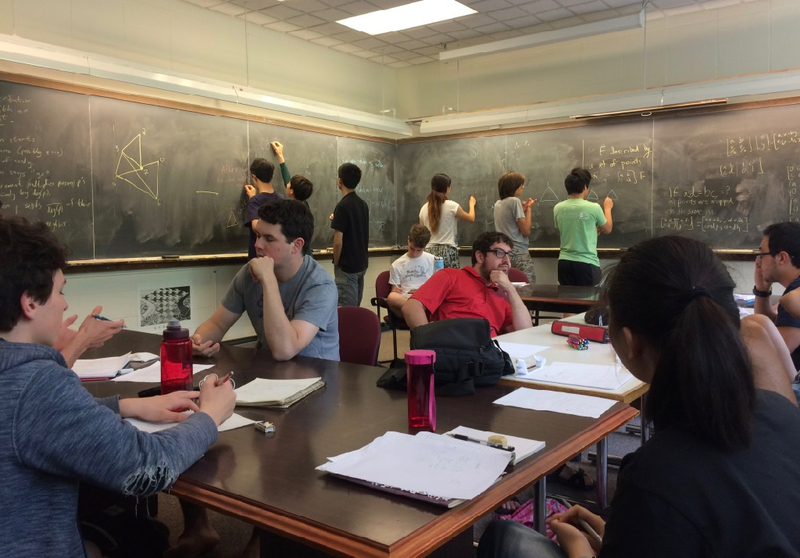 The weeks break down into a 2-1-2 schedule: We start with two weeks of Root Class, which consists of a gallimaufry and melange of mathematics that gives all students a base on which to grow. This is followed by Week of Chaos, in which there are many many short classes with topics suggested by students and instructors alike. 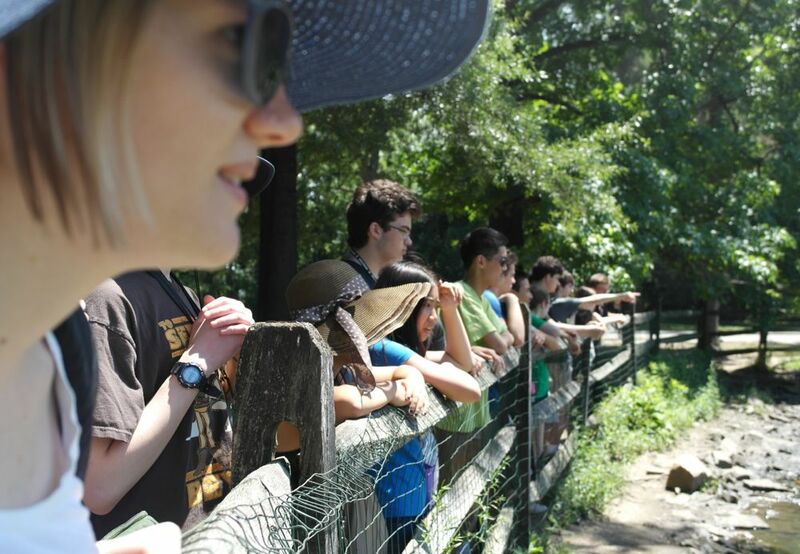 The denouement of the program offers more advanced Branch Classes in the final two weeks. As can be seen on the board, aliens attacked Devil's Tower on the first day of Root class 2018. Mathematical content: It's undergraduate- and graduate-level mathematics not usually encountered in high school. (You may correctly conclude that calculus is not one of the topics on offer---we don't want to spoil anyone's fun!) The core of the curriculum is discrete mathematics, with additional material determined partly by the interests and direction of the class. Topics for Root Class will certainly include combinatorics, graph theory, affine geometry, and theoretical linear algebra, and are likely to include some proof techniques, number theory, probability, group theory, and cardinality. Some of that may sound familiar, but at MathILy we approach the material with perspectives that will be new to you. Each topic will be treated in depth, or at an advanced level (or both!). There is additional material available for returning students and new students with particularly strong backgrounds. If there's a topic you want to learn about and your class doesn't discuss it, ask that it be offered during Week of Chaos! Topics could include alternate geometries, ciphers and cryptography, combinatorial optimization, generating functions, information theory, knot theory, Markov chain modeling ... and that's just from the first half of the alphabet. For 2019, the Branch Class topics are likely to include topological graph theory and the mathematics of paperfolding. 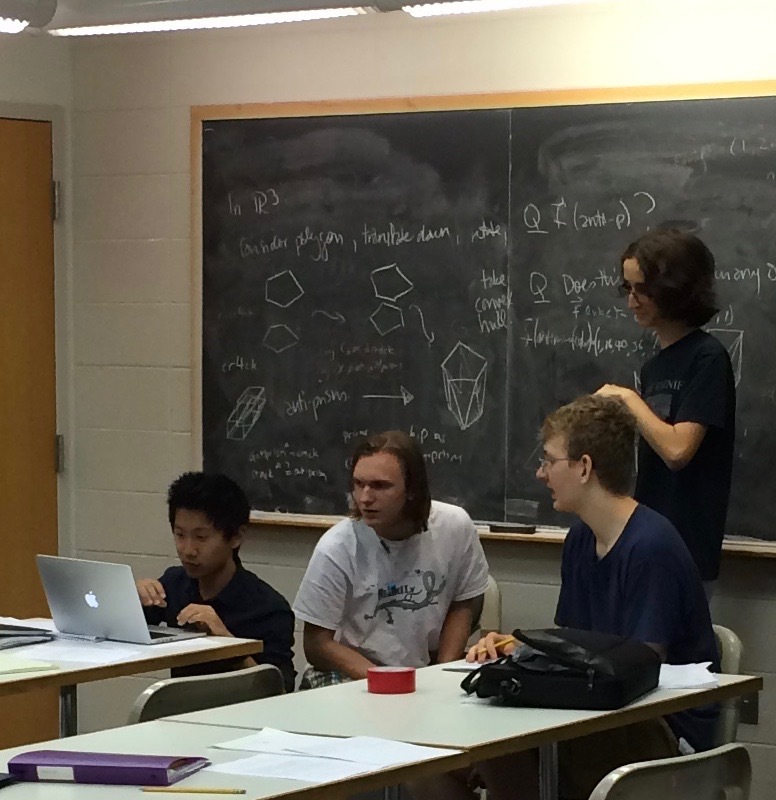 Students are using Sage to generate 3- and 4- dimensional polytopes. MathILy is for high-school students. If you're not in high school, we will still consider your application, but high-school students generally take precedence in admissions. See the application process page for more details. The dorms are really nice, and have air conditioning. (So do the classrooms.) You're very likely to have a single room. The campus is beautiful...really beautiful. And very safe! Campus is also right near a hospital, shopping center, etc. Practical stuff: We'll tell you how to get to campus (planes and trains and cars all work well), what you will want to bring (there is a list), details of internet access, how dietary restrictions are accommodated, what the precise daily schedule is, and more, after you've applied and if you are admitted.